First and foremost Kuntao Silat is about survival. You must understand how attacks happen. Avoidance, Awareness & Deterrence must be trained. One of the key principles of ANY self defense based martial art is that you DO NOT exchange with the attackers. You do not square off with the attackers. You do not trade hits with the attackers. You do not wrestle with the attackers. Many many people get this wrong because the art (or the practitioner) is coming from a sport based background, mindset or strategy. Dirty kickboxing is NOT self defense. Training to break the rules of an MMA match does NOT make your art a self defense method. Because the underlying principles and assumptions of the method are base on a SPORT environment. Ideally none of these are the case. However as a Self Defense art we must assume they are and train to be effective anyway. …but it is NOT a self defense method. So in Clear’s Kuntao Silat we Do Not Exchange with the attackers and we make sure everything bad happens to the other guy. Power without effort is critical. …and you must be able to do so with little to no effort. Because if you are old, sick, injured, etc… you may not have the luxury of putting out much effort to defend yourself. The ‘little to no effort’ part takes some work. So we’re going to focus on that a little later. You must assume the attackers are also able to destroy anything they can touch. Either way, YOU must control every point of contact. AND in trying to do so they will have to put themselves in vulnerable positions. Another important part of Clear’s Kuntao Silat is learning how your defense against a blade is exactly the same as your defense against an empty handed opponent and your use of a blade, stick or improvised weapon is also exactly the same as your empty handed fighting method. 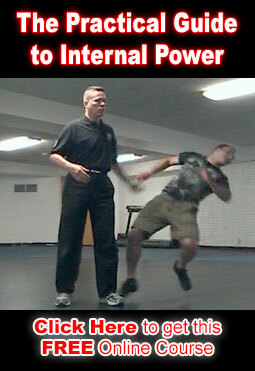 This and more is taught in the Kuntao Silat section (first 4 weeks) of our Internal Combat Arts Course. …Called for two to four inches of rain. By Saturday Afternoon May 1 2010 some of the city had seen more than six inches of rain. By Saturday night the Cumberland had risen 15 feet, to 35 feet, and the Army Corps of Engineers were predicting it would crest at 42. But the rain didn’t stop Sunday. The river didn’t crest until Monday at 52 feet. Nashville saw more than 13 inches of rain that weekend. Twice the previous record (6.6 set in ‘79.) And over 3 times the original forecast. So what does this have to do with a fist fight? We’ll they have one thing in common and one very important difference. It was too low. If it had been higher folks could have been better prepared and a lot of damage and suffering could have been avoided. But if it had been too high, say the forecast was 13 inches and only 2 inches fell, then you’d get the ‘cry wolf effect’ and people wouldn’t prepare next time there was extreme weather on the way. In a fist fight, there is also a forecast. Is this a friendly boxing match with medium power? Are we going to end up wrestling around in the mud and gravel? Is this a knockdown drag out pound on each other ‘till we’re both exhausted kind of thing? Or is someone going to pull a knife and start cutting off pieces? And you’d better be right. The first time your forecast is too low, you’ll end up cut to pieces before you even realize they drew a knife. If your forecast is too high you’ll end up in jail. The problem with weather is that we’re stuck with it. (at least in the short term) We just have to learn as much about it as we can and get better and better at predicting it. For a fist fight to occur you need at least two people who are willing to fight. This is great! Everybody lives, No injuries, no legal consequences or paperwork. Or 2. The other guy attacks you. But, there are no decisions to make. You don’t have to worry about which techniques are justified and which are not. Your life is in immediate danger. Simply do whatever it takes to stay alive. Of course you try to make sure option #1 is the only one available. Unfortunately you don’t always get to pick. The other guy does. Make the attacker choose long before he gets close to you. Make the attacker announce his (or her) choice both to you and to anyone nearby. Of course you need to practice, but it can be learned in a day or two. Those 3 things allow you to take charge of a situation and keep you safe. You can learn how to use them on our Street Tactics DVD. A couple days ago, I mentioned that someone with training can be deadly enough empty handed that you must defend yourself as if they had a knife. Yes, we are talking about self defense. Yes, we are talking about thugs, street criminals, gang members and whoever else. and Yes, those are trained and skilled martial artists. They may not have a belt, a uniform or a pair of Boxing gloves. They may not have a name for what they do. But they most likely have more real world experience than you. And they most likely have at least semi-formal training from folks with a lot of hands on practice. In Clear’s Silat we always assume the attacker is skilled, armed & has friends. Training is much more fun that way. …that empty hand fighting is somehow different from knife fighting. A lot of folks assume that an empty handed attacker is less dangerous. Because poor quality training is so common they are often correct. …can do a lot of damage without a weapon and with very little effort. In much the same way an unskilled attacker with knife can do a lot of damage with very little effort. If you let them touch you, there’s a very high chance they can do enough damage to be a serious problem to your health. So if you respond to an empty handed attacker as if they are any less dangerous than an armed one, you are setting yourself up for failure. This is why we respond as if the attacker is armed. Even when we’re training empty handed. Oh, and this also works the other way. Even when I’m empty handed I move as if I had a knife. But I’ll talk about that some other time. A large percentage of knife attack survivors will tell you they had no idea a knife was involved until well AFTER the attack was over. So, assuming you will know whether an attacker is armed or not is a big mistake as well. It’s true for Self defense. Walk left side: Destroy the threat. Walk middle: You either use more force than is justified by the situation and end up in deep legal and moral trouble or you don’t use enough force and get killed. Walk right side: The attackers cannot reach you. Walk left side: You are so close the attacker is overwhelmed. Walk middle: You are in hamburger range and that is what you become. Walk right side: You are so heavy and solid the attacker will break their fist if the strike you. Walk left side: You are so elusive the attacker feels like they are punching the air. Walk middle: Your solid enough to be hit and soft enough to take the damage. You’ll see these extremes throughout our programs. P.S. The workshop with Willem (Uncle Bill) DeThouars is only 4 days away! In the media over the last few years there have been more than a few raving reviews about Krav Maga and some reviews listing Krav Maga complaints. Following is a critique of Krav Maga with some Pros & Cons. The Definition of the words Krav Maga is Close Combat or Hand To Hand Combat. The main Krav Maga instructors in Israel take a very Jeet Kun Do approach to learning and simply want to find the best training they can that works. So the Israeli’s do seem to be very committed to getting the best instruction they can for their troops. However, due to the necessity to learn only what can be picked up in a very short period of time, such as in a seminar environment, a lot of advanced techniques and methods are not generally present in the art because they simply do not get past basic skills in the amount of time that is allotted for training. Also, camps and seminars tend to cover a lot of material which gives great exposure to an art form but often does not impart very many skills to the participants because very little time is spent on any one thing making retention of the material very difficult. There are some credible Krav Maga instructors and organizations that have strict advancement requirements and make sure that their instructors have quality training. However, one of the main Krav Maga programs offered in the United States is a 2 week instructor training camp whereby participants pay to become certified instructors with only 2 weeks of training. People can learn to defend themselves relatively quickly as in a few days or a week. To master the material in a way that you can reliably teach others to defend themselves takes a lot longer. All I can say is that this is very unfortunate and a real bad mark against the credibility of Krav Maga and that legitimate instructors pay the price for this kind of cheap marketing scheme of self defense. Krav Maga is one of the few martial arts that spends a fair amount of time on Gun Techniques. Unfortunately two of the favorite techniques that every Krav Maga instructor that I have seen demonstrate are exceptionally likely to get you killed and was the primary reason that I never put much serious time into this art. There does seem to be a great difference between what is taught to the Israeli military and American Civilians. Personally I go out of my way to avoid watered down versions of self defense. In conclusion the thing I like best about Krav Maga is that the better practitioners of the art train very hard and seriously in an attempt to make sure that they can really apply what they have in a self defense situation. Of course most other serious martial artists do likewise. I find that Krav Maga is an art still in progress and that the Israeli military is still training in other forms of martial arts to try and fill the gaps in their art. Many other arts have been around a lot longer and are much better suited to real self defense as they have been created and modified by people who have been using their arts in conflicts for centuries as opposed to decades. Of course I always use Silat as my benchmark for what constitutes a truly effective self defense art. This review is by no means definitive and only reflects my exposure to the art at the time of this writing.